Don’t see your VTX? Let us know! Don't worry, the TBS RaceTracker works with EVERY video transmitter, even if we are missing it here. The Aowmay is transmitting a full range of 32 channels and only weighs 6g. Dip switches 1-3 control your channel, while dip switches 4-5 control your band. Switch 6 is unused. Simply match and go! 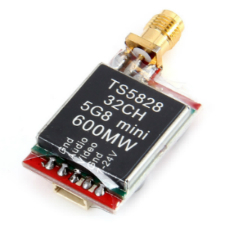 Bosom TS 832 5.8GHz 600mW This VTX features 2 convenient buttons for managing your frequencies. First digit displays your current band, 1-4. Second digit displays your current channel, 1-8. Simply push the buttons until the desired frequency is displayed. Avoid using high powered video transmitters for group flying as they may stomp on your fellow pilots’ feed! Boscam RC832 32CH VRX Click the CH button to switch channels & FR button to switch bands (Frequency). 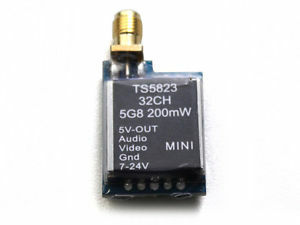 Boscam TS5823/8 5.8GHz 200/600mW Dip switches 1-3 control your channel, while dip switches 4-5 control your band. Switch 6 is unused. Simply match and go! Dragonrider DRAK 5.8GHz 25-600mW Quick push to switch channels, push & hold to switch bands. Eachine ET200/600 5.8GHz 200/600mW This VTX features a simple 1 button interface. Quick push of the button switches channels, while pushing and holding switches bands. Fatshark Dominator 32CH VRX Module (Raceband) The 2 dip switches control your desired band. Use the channel switches located on top of your goggles to change channels. Foxeer TM200/600 5.8GHz 200/600mW Quick push to switch channels, push & hold to switch bands. FX799T 5.8GHz 200/600mW Quick push to switch channels, push & hold to switch bands. Hawkeye/UBAD 5.8GHz 200/600mW Dip switches 1-3 control your channel, while dip switches 4-5 control your band. Simply match these with your desired frequency and you’re set. 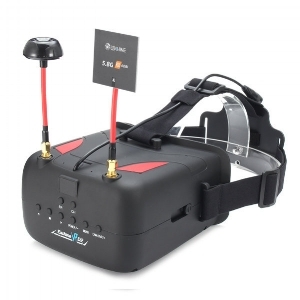 Avoid using high powered video transmitters for group flying as they may stomp on your fellow pilots’ feed! Hawkeye/UBAD 5.8GHz 200mW Raceband Dip switches 1-3 control your channel, while dip switches 4-5 control your band. Simply match these with your desired frequency and you’re set. Immersion RC 5.8GHz 600mW This VTX features a simple 3-toggle dip switch for frequency management. Just match them to the desired frequency and you’re set. Click the channel button to change channels. To access frequencies outside of the Fatshark band, power on while holding both channel and band buttons down. 10 beeps confirms unlock. Depending upon the Tramp variant purchased, the power output level, and available transmit frequencies can vary. Click on the side switch to enter the menu. Click down twice and select manual mode. Up & down clicks allow you to set your desired frequency. With IR (infrared) technology you can quickly switch any setting from your Main Module or with the handheld remote. Lumenier TX5G6R 5.8GHz 25/200/600mW Quick push to switch channels, push & hold to switch bands. Lumenier TX5GPro 5.8GHz 25/200/600mW Quick push to switch channels, push & hold to switch bands. Quick push to switch channels, push & hold to switch bands. Featuring a 3-toggle dip switch similar to the ImmersionRC, tuning in to your desired frequency is as easy as matching the toggle positions with the image to the right. 25mW of power is perfect for indoor flight. We suggest 200mW for outdoor group flying. The 16 channels are made available via the first 5 pins of the dip switches located at the front of the transmitter. Dip switches are encoded in binary format, please reference to below table for the switch position to channel mapping. There are categories in the menu, and settings. Pressing the button for 3 seconds will toggle between categories, pressing it for a short (<1 second) time toggles between settings. To enter the menu, hold the button for 3 seconds. LED colors will signal the state of the menu, for an overview see the following table. The selections in orange requires HAM license to operate legally. The video transmitter ensures that you cannot select illegal channels or power levels by accident.